Like all loving parents, many cat owners enjoy celebrating the birthday, or adoption date, of their beloved felines. While cats ignore cakes and calendars, the humans in their lives relish the chance to spoil their pets with gifts and special treats. Cats' preference for celebrating with a catnip mouse and a snooze in the sun may make them terrible party planners, but they'll still enjoy the event that you've created. If you decide to invite other cats to share Mr. Whiskers' big day, limit the guest list to only cats he knows, or introduce them a few days before the party to reduce the hissing. If yours is a multi-cat household, get a small gift for the non-birthday cats to prevent gift envy. Ask human guests to attend in costume, the cattier the better. Lions, tigers and leopards are fun choices, along with characters from the cast of "Cats." Other possibilities include guests dressing as their own cats, or as sweet-faced Hello Kitty, rotund Garfield or Dr. Seuss's famed Cat in the Hat. And speaking of hats, you could opt for just hats instead of full costumes. Encourage guests to concoct their own cat-inspired chapeaux, or have a supply of funny party hats and trimmings for on-the-spot creativity. Get smaller versions to place on the cat/cats, if they'll stand still to allow it. A quick and simple party theme is one marking the current season: Colorful leaves, cornucopias and pumpkins are easy choices for autumn. For summer, go beachy with beach balls, sand pails and seashells; for winter, try fake snowflakes and icy blue-white decorations. Or think Christmas in July, setting out an artificial tree bedecked in cat ornaments, and tiny stockings for each guest. Generosity is the theme for this party. Check with your local pet shelter or rescue group to see what items are most needed, then enclose a list of suggestions with invitations. Most shelters can always use food, bedding, litter and litter boxes, but inquire about toys and treats, too. Shelter cats deserve a little extra TLC. Print out photos of cats at the shelter you're donating to, displaying these around the table. If your cat was adopted from that shelter, add a gift from him, too. Book club members know the fun of sharing a favorite title with others. Since cats aren't known to be big readers, ask your human guests to bring a book about cats, then take turns talking about their choices. Encourage guests to swap for a title they find intriguing. Whether a funny collection of cat cartoons, a comprehensive cat-care tome or a novel featuring feline sleuths, such as Rebecca M. Hale's "Cats and Curios" series, everyone will discover something new to read. Decorations are easy: plenty of cute kitty-cat and famous feline-themed paper plates, cups, tablecloths and hats. Choose your favorite colors, or coordinate with your cat's coat: Red or purple looks regal with a tortoiseshell, and pale blues pair well with a Siamese (matching his eyes)! If you're inviting feline guests, have plenty of disposable food and water bowls to serve up their goodies. Disposable litter boxes -- one for each kitty guest and one extra -- ensure the visiting cats' comfort. Give each a fresh catnip mouse or other small toy. Serve humans easy finger foods such as mini-sandwiches, fresh fruit, assorted soft drinks and of course the cake. 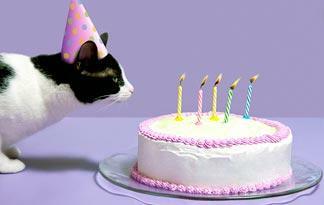 For cats, a slice of feline birthday cake (see more on the next page), plenty of fresh water and a dash of catnip is the ideal menu. Add a fun centerpiece to capture the cat-happy vibe: plush stuffed cats snuggled into decorative baskets, or a brightly colored cat-shaped pi?ata to stay intact or be smashed later by guests. Avoid fresh flowers that might tempt the guest of honor to nibble. Remind guests to bring their own video and digital cameras, and have your own charged up and ready to capture the action. Provide feline-themed party favors for humans and their own cats, whether their pets attend the party or not. These could be cat post-it notepads, cat pens, a cat refrigerator magnet or a cat coffee mug, or new toys for the cats. What's a birthday without a great cake for the guest of honor (and his feline friends) to enjoy? You cat would so agree. For your cat, create a simple cake from canned cat food. Turn a can or two of his favorite flavor upside down on a plate (let those fresh juices form a dripping kind of icing). Adorn with an unlit candle for the full birthday effect. Cut into cake-like slices if other cats are present or simply let Kitty dig in and enjoy while the human guests watch. Or you may opt for something grander, and go for a special cat cake from a gourmet pet store or online supplier. Order well in advance, and discuss the ingredients with the chef. If your cat is not accustomed to eating seafood, you don't want a tuna-flavored cake. Cat-friendly cakes may look just like a regular birthday cake, or could be molded into a cat shape. You can also buy kits with everything but the pan to prepare your very own feline birthday cake. For human guests, serve a cake adorned with kitty decorations, or one shaped like a cat. Order from a favorite bakery, or make it yourself: Get one of the many cat-shaped pans available, along with food coloring in the right cat colors. Even black-and-gray tabbies or calicos can be rendered in realistic frosting shades. If you'd prefer cupcakes, embellish them with whimsical cat faces, adding whiskers, ears, eyes and noses from bits of cut-up candy or icing trim available in bakery supply or craft stores. Bake enough for each guest to take home an extra. Want a cool cat for hot weather? Fill a cat-shaped pan with slightly softened ice cream or sherbet. Place in the freezer, then unmold for the party on a chilled serving platter. Add another flourish of creativity when you invite your cat's friends (and yours) to the big event. Embellish a pack of ordinary commercial invitations with photos of your cat. Use a digital camera and snap a variety of poses if possible, then print wallet-sized versions to cut out and paste on the front or inside the invitation. Add a cute caption ("Feline like celebrating? Me too!") along with the party details. If you're requesting donations for a cat rescue group or shelter, offer suggestions for needed items. Are cats among the guests? Address the invitation to the cat, care of his or her human. Remind the cat owner that his feline companion will need to arrive in a carrier. If you prefer to make your own, cut out cat shapes from construction paper, or use a paw-print or cat-shaped rubber stamp and inkpad, a touch of glitter, a colorful felt-tip pen and plain cardstock to create unique invitations. Print images of cats and kittens, or Garfield, Sylvester, Hello Kitty or the Cat in the Hat, and paste them on the invitations. Put words in the mouths of these famous felines for an added chuckle when guests receive their invitations. For a final cat-like touch, use cat postage. The U.S. Post Office offers shelter pet-themed stamps that feature several sweet-faced kitties. Or skip the paper and postage, and go totally green. Create an email invite featuring your cat's photo and all the party 411. If you have time to produce it, opt for a video invitation featuring your cat. Position him with cue cards spelling out the party details. Add a music clip -- maybe Lesley Gore's "It's My Party" -- and hit the send button.